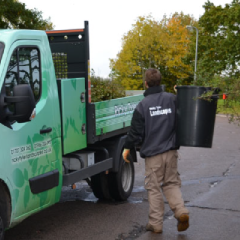 Ricky Tyler Landscaping is your number one choice for all commercial and residential grounds maintenance in Beaconsfield, Buckinghamshire, and all surrounding areas. For all Beaconsfield's commercial needs, we offer top quality grounds maintenance and landscaping. We understand that your business is your livelihood, and as such, you want it looking at its best all year round. We offer a regular contracted maintenance service and can also provide our services on an occasional, ad hoc, basis. We offer emergency repairs and maintenance should you need it. For example, if your commercial premises is over-run by water or other bad weather, we will restore things to their former glory. Our commercial landscaping services can really transform the look and atmosphere of your premises. We have seasonal and year-round solutions to fit any budget so call now to make the change. Our business is to keep Beaconsfield businesses looking great. So, whether you need regular, ongoing maintenance, a spring clean or just a one-time fix, we have a solution to meet your needs. One of our friendly professionals is happy to visit you on-site to discuss exactly what you need. For the house-proud Beaconsfield homeowner, we have a range of professional garden maintenance and lawn care and turfing services. Whether you are looking to spruce up the garden, lay new lawn, or maintain your existing green space. We know that you value your garden and that it is unique to you. So, we tailor our services to your needs. Call today and you'll soon be looking forward to the best your garden can be. Our services are provided by our uniformed, professional gardeners who have years of experience and many happy customers. 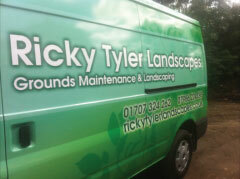 With our beautiful green Ricky Tyler Landscapes vans, you'll know it's us when we visit. Whether you are in Beaconsfield, Woodburn Green, Flackwell Heath, Loudswater, Little Marlow or anywhere else in our area, call us today. Ricky Tyler Landscapes can provide gardening and grounds maintenance services including Beaconsfield Grounds Maintenance covering Beaconsfield, Buckinghamshire .